One of the most popular European river cruises is the Heart of Germany cruise that plies the waters from Nuremberg to Frankfurt. As you wend your way, you will have the opportunity to immerse yourself in World War II Nazi history, visit the Palace of Justice, sample various cuisines, and shop for wines, beers and other items at ports of call along the way. This seven-day cruise along the Pegnitz River begins in Nuremberg where you can walk around the old part of the city that is still graced by structures, gates and watchtowers dating back to the 13th century. Be sure not to miss the Palace of Justice where Nazi war criminals were tried. Stop for lunch at Historische Bratwurst-Kuche Zum Guldn Stern, which is the world’s oldest bratwurst restaurant and where the brats are still roasted over a beech-wood fire. Another place to visit in Nuremberg is St.Sebaldus Church that dates back to the 1300s. Here you will see the bronze shrine where St.Sebaldus is interred. This breathtaking structure is one of the best examples of Germany’s Gothic ecclesiastical architecture. Availing yourself of a guided tour of Albrecht Durer House allows you to see the normal lifestyle of a prosperous German during the early 1500s. For a souvenir treat, pose for a picture with the owner of Scherenschnitt Studio or stop near the Old Tower gate to purchase a memento of your trip such as spicy, nutty lebkuchen Christmas cookies. Our next port of call is the UNESCO World Heritage Site medieval city of Bamburg. Take time to stroll along cobblestone streets or sit around one of its outdoor cafe tables to admire the city’s steep roofed multi-plex houses and shops decorated with flower boxes and flags as far as the eye can see. Its now time to cruise on down the river to Rothenburg to visit Germany’s Christmas Museum which is open all year as well as its Christmas market. One highlight of our visit to Wertheim where the Main and Tauber rivers merge is the majestic sandstone castle that towers over the town’s main square and exuding an aura akin to that of Bamburg. Although we will actually be in Frankfurt, we must visit nearby Heidelberg where we will get a much more personal and upfront encounter with castle life as we tour the ruins of Heidelberg Castle and get a distant view of Speyer where some Roman emperors of the Celtic era are buried. Viking River Cruises offers a 10-day cruise through East Germany from Berlin to Prague via the Elbe River. In addition to walking through the Brandenburg Gate, one place definitely not to be missed is the Jewish Museum created by New York architect Daniel Libeskind, whose goal was to acquaint visitors with the atrocities Hitler inflicted on Jews during the Nazi era. A visit to Checkpoint Charlie will give veterans and military buffs a deeper appreciation for this spot and its role during World War I and II. If you haven’t had your fill of castle visits yet, visit Sanssouci Castle erected by Frederick The Great in Potsdam. One of the highlights of this castle is its massive marble cupola. For most of us, visiting Worlitz Castle exhibits a more realistic lifestyle since it is an example of a traditional English country estate. During our visit to Wittenberg, we have the opportunity to tread where Martin Luther trod as he preached at St. Marien’s Church and to visit the monument where American and Russian troops met and shook hands in 1945. The city’s marketplace features a statue of Martin Luther who was once a city resident. It is interesting to note that this area formally referenced as The Markplatz was added to the list of UNESCO World Heritage Sites in 1996. While in the ports of call at Meissen and Dresden, be sure to procure a few pieces of some of the world’s most beautiful pottery, china or jewelry. Now we move on to a fascinating part of Germany known as Saxon Switzerland to visit Saxon Switzerland National Park that is definitely a different landscape than any of America’s national parks. Our last three days will be spent in the Czech Republic city of Prague, known for its red tile roofing. If you visited the Jewish Museum in Berlin, you should take time to visit the old Jewish Cemetery in Prague that is believed to be one of the world’s oldest final resting places. 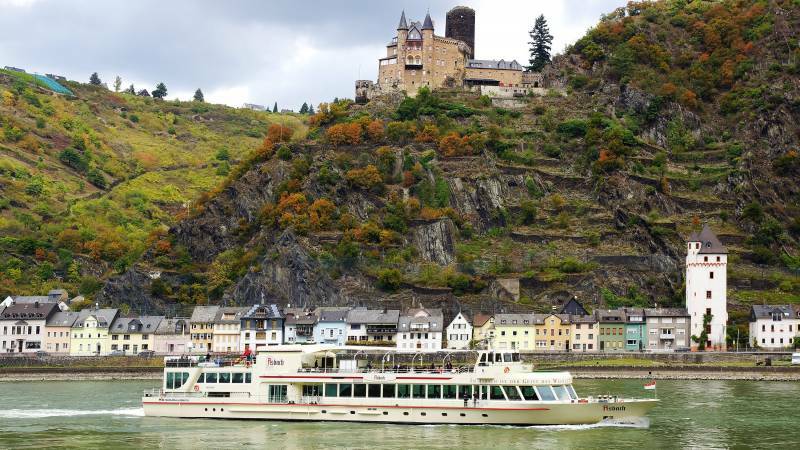 If you have never embarked on a river cruise through Germany before, many travel agents and cruise companies suggest that a Rhine River cruise is the ideal way to start. One highlight of this cruise is a visit to the Rhine Gorge area where grapes are cultivated in its Moselle Valley. Another port of call on this cruise is the birthplace of Beethoven in Bonn. Included on this cruise is the Cathedral at Cologne. According to historical accounts, this massive structure required 600 years to complete and is touted as one of Germany’s most outstanding buildings. During this cruise, visitors will have the opportunity to take an interesting off-water adventure aboard a cable car departing Koblenz to visit Ehrenbreitstein Fortress. Another site not to be missed is Cologne’s Chocolate Museum, after which you may have a new appreciation of all things chocolate. Your bucket list of places to visit during port of call stops should include Heidelberg, Germany home to a world-renowned university bearing the same name. Trier, Germany is a must see because it is believed to be the country’s oldest city and was the death site of many Roman emperors. To experience Christmas dinner featuring a cuisine quite different from our traditional British or American menu, visit one of the eateries in Andernach. Be sure not to leave Andernach before you visit the mechanical music museum of Seigfried. You may think you know something about spas until you visit the Rhine River city known as Bad Ems where aristocrats, tzars and various monarchs were said to have enjoyed various types of spa treatments.